classmates out of Maze Cave on May 24 north of Shoshone. As Gooding sixth-graders emerged from a cave north of Shoshone, they squinted as their eyes adjusted to the sunlight. 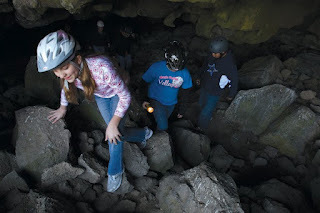 The hourlong experience navigating unstable lava rocks inside the cave didn’t seem to tire the middle school students. They were chatting and laughing as they waited to get back on the school bus. “They were really, really fun to go into,” 12-year-old Callie Graves said about going into two caves. It was easy to see inside, she said, because she was wearing a headlamp over her bike helmet. Riken Schulthies, 12, held up the bike helmet he was wearing, which had many small scrapes on it from the cave ceiling. He said caving was fun and he wants to go again. The highlight of the trip: “We got to learn about fungus,” he said. Rangers and interns from the U.S. Bureau of Land Management’s Shoshone field office led a few school field trips last week at the Maze and Tee caves. It was part of the agency’s Take it Outside program. Shelley Davis-Brunner, Idaho’s youth program lead for the BLM, said the national program began in 2010 to provide outdoor education experiences for children. Each Idaho field office comes up with its own program and finds participants. Davis-Brunner said the goal is to promote outdoor physical activity and help children become more aware of what public lands are nearby. “A lot of us take for granted the things right around us,” she said. With a number of caves in south-central Idaho, caving is one of the Shoshone field office’s outreach activities. David Freiberg, outdoor recreation planner for the Shoshone office, said the programs are available to any schools that are interested. The office works most closely with the Shoshone and Gooding school districts. There’s an annual agreement in place between the BLM and those districts to provide field trips. But the BLM has also provided trips for other districts in the past. School employees, Freiberg said, are welcome to call the Shoshone field office for more information. He said he’ll try to accommodate requests from school groups as best as possible. The office, though, doesn’t have enough funding or employees to do trips every week, he said. Last week, BLM intern Justin Peinado, 20, a college student from Northern Arizona University, led groups of students on cave tours. The El Paso, Texas, native who is pursuing a geology degree goes to caves a few times a week to collect data and monitor wildlife inside. And that includes the Maze and Tee caves. The caves are about eight miles north of Shoshone. A winding, rocky road off Highway 75 leading to the caves makes for a bumpy ride for a few minutes. Besides a sign near the highway on Thorn Creek Desert Road, there aren’t any markers to show where the caves are located. When Gooding Middle School students arrived for their field trip May 24, they split up into two groups. One went into the Tee Cave, while the other went into the Maze Cave — just a short walk away. From a distance, it’s hard to spot the underground caves. After getting closer, the small openings to the caves are barely visible and surrounded by piles of lava rocks. Wind blew across the sagebrush-covered landscape outside as dark clouds formed overhead. But it was quiet inside the pitch-black caves. With a variety of caves in south-central Idaho formed by lava flows, there are easy options for beginning cavers and other options for experienced outdoor enthusiasts looking for a challenge. But it isn’t always easy finding the cave locations. Anderson — an astronomer for The Herrett Center for Arts & Science — said spelunkers tend to be secretive about naming locations. That’s because some caves are “unbelievably trashed,” he said, and there have been problems with vandalism. Anderson is the chairman of the local “Silver Sage Grotto” caving group. They’re affiliated with the National Speleological Society. Caving — also known as spelunking — has been Anderson’s hobby for several decades. He discovered the activity as a high school student in the 1970s. As part of the caving group, he said a goal is to protect and preserve caves so others can enjoy them. The group — which has about a dozen members — occasionally goes on trips to clean up the caves and pick up trash. Interested in learning more about caving? The group welcomes visitors to their meetings at 7 p.m. the second Thursday of each month on the second floor of the Taylor Building at the College of Southern Idaho. “We won’t tell you where the caves are,” Anderson said. First-time cavers can get help finding cave locations by calling or visiting BLM offices. It’s just the beginning of the caving season. Many area caves are closed from Oct. 15 to May 1 since it’s bat hibernation season. Although caves are open now, that might not be the case in the future. Around the country, some caves are closed due to White-nose syndrome — a disease that has killed millions of bats. “It’s really impacting a lot of populations of bats,” Davis-Brunner said. The disease hasn’t reached Idaho, Anderson said. But members of the caving group are still taking precautions. Members go through a “rigorous contamination of gear,” he said, before moving from one cave to another. Davis-Brunner said if a group of people goes into a cave with infected bats and then move to another cave, the disease might spread to other bats. “The reason it is a concern is that it’s easily spread through contact,” she said. When embarking on a caving trip, some people don’t come prepared. Anderson encourages visitors to dress in layers, wear sturdy boots and gloves, wear a helmet and bring multiple sources of light — such as a headlamp or flashlight. The inside of a cave is a “very different kind of environment,” he said. There isn’t any natural light inside a cave and the temperature typically stays about the same year-round — in the 50s. Outside landscapes are exposed to elements such as wind and rain. But inside the caves, structures look much the same as when they were first formed. Lava caves in south-central Idaho, Anderson said, don’t have spectacular structures and tend to not be as complex as limestone caves. Limestone caves are still living and changing with water processes. That’s not the case with lava caves. Anderson said if damage occurs to fragile lava, it won’t grow back. Types of caves vary greatly, but some require skills similar to “rock climbing or scrambling,” Anderson said, and it’s important to move slowly in order to avoid tripping. Some caves allow people to walk for hundreds of feet. Others involve crawling through tight spaces. Anderson said there aren’t any caves in south-central Idaho where visitors could get completely lost. Besides looking at a unique landscape, caving is also a way to get a good workout. And it’s common to walk away with bumps and bruises after a caving trip. “If you want a challenge, it’s there,” Anderson said.